A billionaire entrepreneur and founder of the country's leading biotechnology firm Biocon, Ms Mazumdar gave this suggestion to the Congress during the party's ''manifesto consultation meeting on IT and BT Economy'', chaired by P Chidambaram. 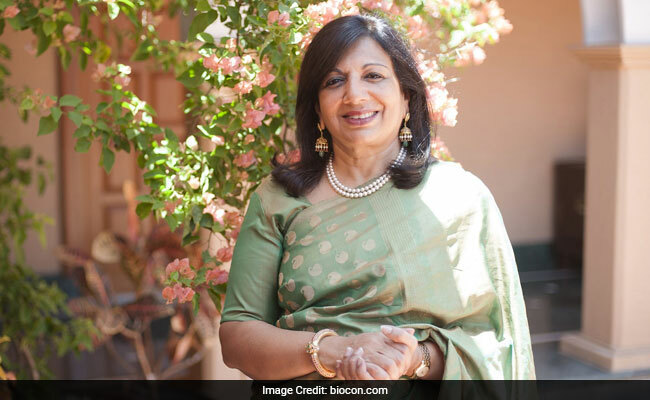 Kiran Mazumdar has been listed by the Forbes as amongst the 100 most powerful woman in the world. India's biotechnology industry pioneer Kiran Mazumdar-Shaw on Sunday urged the Congress to commit itself to the growth of a robust digital economy in the country and include it in its 2019 Lok Sabha poll manifesto. "Your manifesto must focus on creating a digital economy that helps everyone. That could be the most inclusive part of your manifesto," she said, addressing the Congress manifesto consultation meeting. "There are 800 million plus people in our country using mobile phones and you should be able to provide that connectivity and access to the market and capital. That is the kind of digital economy we must create," said Ms Mazumdar, listed repeatedly by the Forbes as amongst the 100 most powerful woman in the world. While focusing on creating digital economy, even agritech should be given importance to help farmers, she said. Ms Mazumdar also pitched for GST exemption for drugs and devices, besides hospital services, which would allow India to start delivering a semblance of universal healthcare system. She also urged the party to include in its manifesto a good startup policy with provisions for incentives to entrepreneurs to help the growth of startup economy. "By doing this, I, for one, really believe that this is something which will actually transform India in a big way," she said. Ms Mazumdar said Bengaluru has a huge job creation potential which has been demonstrated over the years. Bengaluru has created world's third largest startup ecosystem with 11,000 start-ups set up in the last three years here, causing an effect of force multiplier in terms of job creation. "We actually have created close to 800,000 jobs," she added. Ms Mazumdar said "angel investors have surpassed venture capital funding in startup ecosystem and hence, it is important to focus on startups and startup policy". In many cases, ''angels'' are the last option for startups that don't qualify for bank financing and may be too small to interest a venture capital (VC) firm. She said India is under-invested in science and technology and treading a very scary path. She said the Congress manifesto should reflect its commitment to doubling science and technology spends to catch up with other world economies, which are making huge investment in it. "We have the scientists, we have the talent to actually develop this sector, but we are really doing a disservice to this sector. We are undervaluing it. I would be happy to provide you with greater inputs into what we should be doing to this end," she said. Likewise, the manifesto should also focus on medical education and agritech sectors, she added. India has completely devalued its medical education which is reflected in a disproportionate ratio of availability of MBBS graduates and specialists, Ms Mazumdar said. "While we produce almost 50,000 MBBS graduates every year, the ratio of specialists that we produce is minuscule. We hardly produce 12,000 specialists every year," she said. "You have to create more specialists seats in our medical institutions. National Cancer Institute has been completely destroyed for corrupt reasons. We need to change that, we need to have more specialists seats in the ratio of 4:1," she said.